A key component of enforcement is a well-functioning complaint reception mechanism. It is important that both United Nations personnel and the host population know how to report wrongdoing by UN personnel. UN personnel receive information about how to report misconduct during induction and refresher trainings. The information is often also made available on missions’ intranet sites and disseminated through poster campaigns and/or broadcast messages. 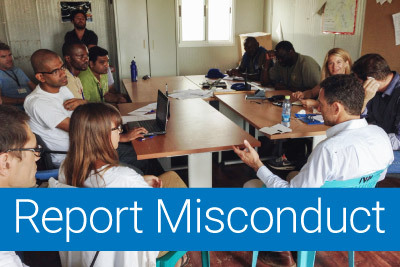 While the avenues of reporting vary somewhat between missions, UN personnel in missions can generally report misconduct over a secure e-mail address, a telephone hotline, using a locked complaint box, or in person to the Conduct and Discipline Team (CDT) who will then refer the matter to the CDT. Anyone can also report misconduct by UN personnel to the UN Office for Internal Oversight Services (OIOS). To raise awareness among host populations of what is acceptable behavior by UN personnel and how to report wrongdoing, CDTs, often in cooperation with other mission components, reach out to host communities, including local government officials, civil society organizations, community groups, international organizations, non-governmental organizations, schools and religious communities. Missions have established community-based complaint reception mechanisms, that can include identifying community liaisons as trusted channels through which members of the host population feel comfortable to report misconduct by UN personnel. The wide range of awareness-raising measures undertaken in field missions include poster campaigns, brochures, websites, theatre and radio broadcasts, often in local languages. When a report is received concerning possible misconduct, specific processes are set in motion. First, the information received is reviewed and assessed to determine whether the alleged acts, if true, would amount to a breach of the UN Standards of Conduct. If there is sufficient information available to make this determination and the alleged acts would constitute misconduct, the matter is then referred for investigation. In some cases, it is necessary for CDTs to gather additional information in order to be able to make a proper assessment. The CDTs record misconduct complaints and associated allegations in the Misconduct Tracking System (MTS), which is a strictly confidential, restricted-access database managed by the Conduct and Discipline Unit in the Department of Field Support. For investigation purposes, the UN Office for Internal Oversight Services (OIOS) has grouped allegations into Category 1 and Category 2, depending on the risk such cases present to the organization. Allegations of misconduct defined as Category 1 include: all cases of sexual exploitation and abuse, cases involving risk of loss of life to staff or to others, abuse of authority or staff, conflict of interest, gross mismanagement, bribery/corruption, illegal mineral trade, trafficking with prohibited goods, life threat/murder, abuse or torture of detainees, arms trade, physical assault, forgery, embezzlement, major theft/fraud, use, possession or distribution of illegal narcotics, waste of substantial resources, entitlement fraud and procurement violations. Allegations of misconduct defined as Category 2 include: discrimination, harassment, sexual harassment, abuse of authority abusive behavior, basic misuse of equipment or staff, simple theft/ fraud, infractions of regulations, rules or administrative issuances, traffic-related violations, conduct that could bring the UN into disrepute, breaking curfew, contract disputes and basic mismanagement. See how an allegation of sexual exploitation and abuse is handled once it is received by the United Nations.